On Thursday the 27th of November 2014 the foundation had her very first fund-raising event in the recently beautifully-restored Museum Mauritshuis in The Hague. It was a great success. The evening kicked off with a presentation on the New Holland Foundation by director Oscar Hefting, outlining the objectives and what the foundation stands for. 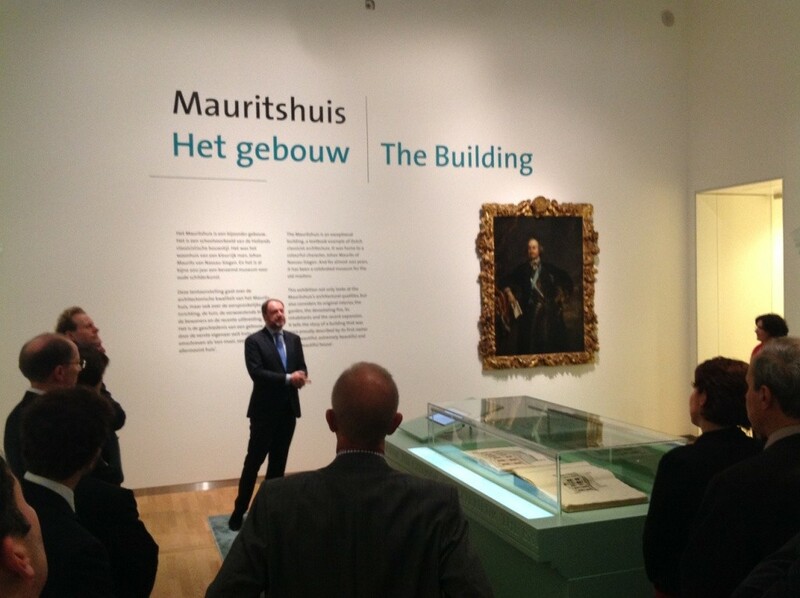 This was followed by a guided tour by curator Quentin Buvelot, showing ‘his’ exhibition Mauritshuis, ‘The building’. The thematic exhibition highlights the many facets of the Mauritshuis and looks back on its rich history and illustrious residents. Drawings, paintings and prints tell the story of the residence of Johan Maurits van Nassau-Siegen, Governor of Dutch Brazil between 1637 and 1644. Many patterns and decorations in the museum reflect this tropical period in the life of the founder. Since then the Mauritshuis has become an icon on the Hofvijver in The Hague and is one of the most famous Dutch Classicist buildings and home to the very best Dutch Golden Age paintings. After the guided tour, director of the Museum, Emilie Gordenker, held a welcome speech, while the guests enjoyed a caipirinha. 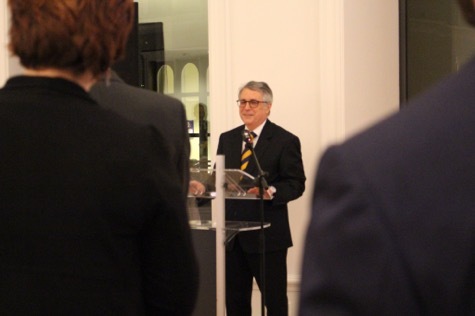 The Ambassador of Brazil, Mr. Piragibe Tarragô, promoted strong relations between Brazil and The Netherlands. He addressed the importance of trade and investment flowing between Brazil and The Netherlands. Finally former Consul for the Netherlands in São Paulo, Jan Gijs Schouten, explained the importance of the work of the New Holland Foundation and the need for strong support. He therefore encouraged everybody to either join The New Holland Business Club or become a Friend of the New Holland Foundation. The next fund-raising event, in the presence of our Patron, His Highness Maurits van Oranje-Nassau, van Vollenhoven, will be held on 29th of January 2015 in the Rijksmuseum in Amsterdam. that have a common history with the Netherlands, such as South Africa, India, Sri Lanka and Indonesia. The results will be presented on the websites of the New Holland Foundation and the Atlas of Mutual Heritage. Last September archaeologists Oscar Hefting and Hans van Westing presented the first results and expectations at the 37th New Netherland Seminar in Albany, NY. 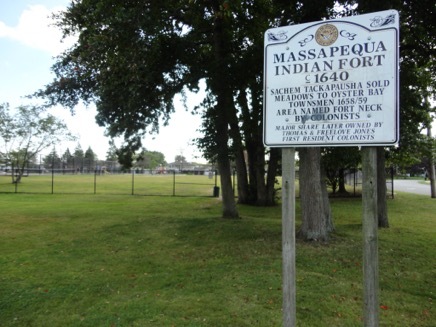 During their visit to the U.S. they visited the remaining parts of the forgotten Fort Massapeag at Massapequa Park on Long Island, NY. In the ‘30-s the American archaeologist Ralph Solecki discovered and excavated a rectangular construction consisting of an earthen wall surrounded by a ditch. He also found some Dutch clay pipes dating from around 1650. His assumption was the site was of Indian origin. The square construction of the fort and the presence of two small bastions, according to Dutch archaeologists, indicates that we are dealing with European or even Dutch influence. Further research into the nature of this fort is necessary. More information can be found on our new website, which has a complete new lay-out and is very easy to access. Please take a look at www.newhollandfoundation.nl. In 2015 the Forts Project will continue. It is proposed to verify, together with local specialists, the results of the historical research with archaeological surveys on location in Brazil and the U.S. In North America at least 37 locations of defence works are expected while in Brazil 78 locations have been cited. Forts can be eroded, hidden or still standing. The information will be fascinating to show in text and pictures on the websites and in publications. In this way our heritage can contribute to a better understanding, communication and cooperation in many ways between cultures all over the world. We wish you a very international 2015!